I had meant to get this post up a little early but you know that little thing called life got in the way. Two days for what you say?! 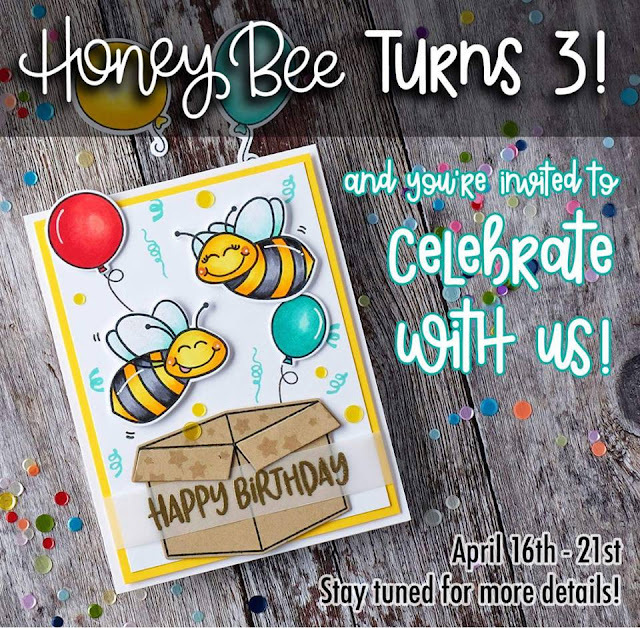 Honey Bee Stamps is Turning 3! In order to celebrate their birthday they are partying it up all week. Starting with a sale! I love a good sale don't you?! You know me, I'm all about pushing outside that comfort zone so here I am colored pencils in hand. No line coloring is always a struggle for me because that bold black outline is my safety net. It's my cuddly blankie I curl up and it makes me feel all warm and fuzzy. However, we are all busy being uncomfortable with being uncomfortable. Unfortunately, you don't grow without a little bit of discomfort. I'm trying to grow. How about you? I started by stamping and masking my images in a very light ink on kraft cardstock. I used my colored pencils to fill in m y image. I rely pretty heavily on my white colored pencil to help both blend my colors and brighten them up. This is especially noticeable when working on dark cardstock. Plus, it makes blending a breeze. I know it sounds like I'm being nit picky in the video. Honestly, I'm good with the way the card came out. I just want to be as honest as possible about what I would change if I did it again. And even though the flowers aren't the first thing to catch your eye that blue vase is really pretty haha. Here you can see a close up of the sentiment. It's not exactly a perfect match but it's close enough for government work. You know what I'm saying? Don't forget to put that coupon code BEEDAY30 to good use. Crafter's are the best enablers aren't they? Thanks you guys so much for dropping by! A beautiful card Kelly, well done as always! Oh, Kelly, I always love your videos, and this is such a sweet card! Love your pencil coloring on kraft, and I also love how you share you foibles with us! We all have them, right? Hehe! Thanks again! Hugs! Gorgeous Card Kelly, I love the use of the hexagons on your background, just a little interest there, great. By the way, I loved also your beautiful flower nails, great job! Thanks for showing this and using coloured pencils.